Drainworks offers RootX plans to help avoid costly sewer lines replacement. What it does? 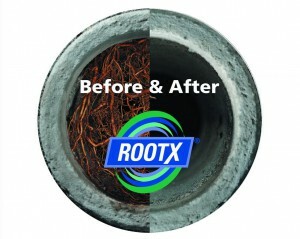 Inhibits new root growth up to a full year improving sewer line flow. Why? Helps prevent costly and unhealthy sewer back up into your basement or home. Who? Mainly older homes with older clay pipe sewer systems and tree roots in vicinity of pipes. When? Get checked out now, if you have an older house with mature trees around your sewer lines. Roundtree, Brentwood, Southern Hills, Phelps, Historic Midtown and other older home construction areas. Tree root intrusion into sewer pipes is always something to be aware of. Root problems can be nasty and expensive! The first thing you may know that you have a tree root problem in your drain or sewer backs up into your basement or home. In and around Springfield older homes with traditional clay sewer piping are particularly vulnerable. There are several remedies depending on the severity of the problem. Cutting out the roots is normally a short term fix because they grow back. Chemical root killers are a better solution once the drains are clear.